We are the developers with vast experiences in the Web Development, Mobile Application Development & Designing. 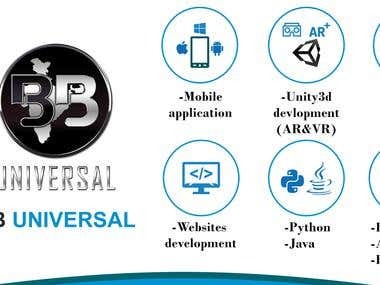 All Developers with specific and individual have 2+ years experience in following technologies: * Website Development - Laravel - Core PHP - Asp.Net - CodeIgniter framework - Wordpress - Joomla *Mobile App Development - iOS (Swift & Objective C) - Android * Multi-Platforms - Angularjs 1,2,4,5 - Java - Python - Ionic 2 & 3 - React Native *Designing - Photoshop (Web, Mobile App, Poster, Banner and many more) - Maya(3D Game Graphics and Models) * Integration - Woo commerce - Shopify - Magento - Order desk * API familiar: RestApi, Google, Facebook, Twitter, LinkedIn, FullContact, Go Shippo, Mandrill, Stripe and Many More. * Payment Gateway: PayPal, Payumoney, CCAvenue, 2Checkout, [login to view URL] and many more. Our "aim" : Give quality and accurate deployment of the project in short time. Here We are looking for: "You Think, We Develop" Let's Develop today. Graphics Designing: - Photoshop(Web, Mobile App Design, Banner, Poster and many more) - Maya (3D Models, Characters, and game UI/UX).